Give your vehicles the protection they deserve with a Rhino Shelter Instant 2 Car Garage. This large instant structure can house two cars, equipment, and home supplies; you could even use it as an outdoor workshop. You're probably concerned that an instant canopy won't be able to protect your belongings as well as traditional permanent structure. But you don't need to be. Constructed with a rust-resistant steel frame and a long-lasting polyethylene cover, this shelter can defend against the elements just as well as any standard garage. And because you can move or even collapse this storage building to suit your needs you'll probably find it more practical. Even more impressive than its durability and efficiency, however, is how simple this instant shelter is to use. In fact, this Rhino Shelter Instant 2 Car Garage is so easy to assemble that it can go from box to free-standing structure in as little as two hours. It would probably take you longer than that just to clean out a traditional garage. So what are you waiting for? Ensure the safety of your possessions with this reliable and cost-effective canopy. Are the end doors triple-zippered? And, is there a roof vent available? The doors are double-zippered and I apologize; we currently do not offer a vented top. How high is the door opening? The door dimensions are 20' W x 6'6" H at the edge. This will be outside in an open area. Will it withstand a winter snow storm? Can I purchase without the anchors? This package is not available without the anchors. How does this fare in heavy wind and heavy snow fall? How secure is its grounding? We want something we can put up for the winter and then take down. Thank you for your inquiry. Rhino Shelter does not have a snow rating and I do not see a wind rating on this as well. The ShelterTube style by ShelterLogic is a unit that has the ratings listed on the products pages. You can find them here Please let us know if you have any further questions. Can the sides be removed for summer months? Unfortunately, this unit consists of a frame and one piece tarp to go over it. There are no sidewalls to remove. And per the manufacturer, we do not recommend rolling up the sides. when in use. This unit does however have doors at each end for convenient drive through capability and better ventilation when rolled up. What gauge steel is used in the frame? Per the manufacturer, this is made with 14 gauge steel. How does this garage stand up to snow? How does it withstand wind? Does it tend to 'walk'? I have heard back from Rhino shelter and they do not have a snow rating and I do not see a wind rating on this as well. The ShelterTube style by ShelterLogic is a unit that has the ratings listed on the products pages. Please let us know if you have any further questions. How long is the warranty and expected life of the exterior tenting? The warranty on this unit is a 1 year manufacturer's warranty. Please let us know if you have any further questions. Do you sell Shelter Logic products? Does your Rhino Shelter Instant 2 Car Garage come with a cover fabric of more than 10 oz? Yes, we do carry Shelter Logic products. 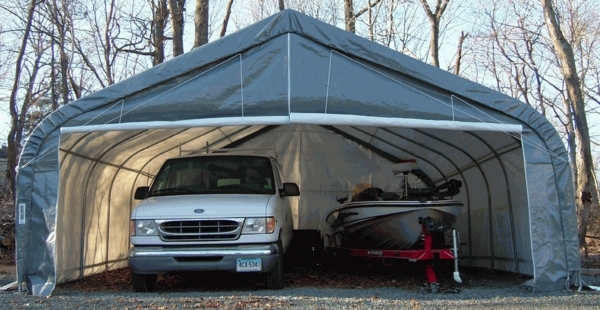 The Rhino Shelter Instant Two Car Garage is not offered with a cover fabric of more than 10 oz since this industrial grade material made with a CPAI-84 rated Poly is more than sufficient to handle rugged conditions, as well as being long-lasting. Is this Rhino Shelter wind rated? How many mph of wind can it withstand? This shelter is not wind rated. Can I buy the Arches and new cover separately? We do not currently carry those replacement items. You would need to purchase those items directly from the manufacturer, Rhino Shelter. I was very impressed with the ease of putting it up. It fit perfectly for one full size suv and one small suv with room to spare. Spending the little bit extra was worth it. I have experience with another supplier and these guys win hands down. The only issue I have is with one of the six zippers of the doors not being straight enough and causing some binding. It will work out. The instructions did not fully match my 22x24 structure but we figured it out. Took the 2 of us several hours to erect, not the 2 hours mentioned. I pulled the cover over by myself on the second day, I'm over 65 years old just for reference. ProsRatchets and webbing to secure main cover. Thickness of cover. Exact locations of pre-drilled holes. Size of support pipes. Overall fit and finish. Looks great. ConsNot enough pipe, rope and fittings for both end doors. Due to 22 ft width I am using 2 rollup doors per end. Had to purchase another 200' ft of rope to finish job of cover tie-down to interior pipes and for doors - not a big deal. Looks like it will do the job. The instructions seem to be for all sizes, took 2 of us about 6 hours with beer and reading the instructions over and over again. ProsNice strong pipes,and cover looks to be very strong.